I have written a number of anecdotal texts about colleagues. These were associated with birthday celebrations. Many of these are not available through the SLAC-SPIRES data base, and some which are available requires access to journals. Here I have put links to the pdf versions of these texts, and where available, to the power point files used in the presentations. I also provide a context for the presentation, and a few associated photographs. 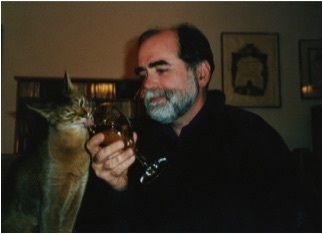 I also include links to various associated anecdotes, such as my attempt to get my cat a job at BNL, animal stories, and an after dinner talk about fishing. At the very end there is a powerpoint presentation I put together on the occasion of my wifes birthday. Helmut Satz has been a friend almost since I began doing physics. 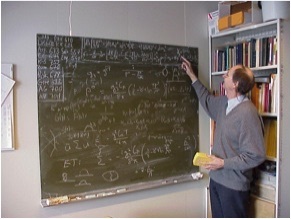 He was the strongest theoretical physicist driving the early efforts to do collisions of ultra-relativistic nuclei. His efforts were initially focused on the CERN experiments, but he also provided much of the motivation for experiments at the Relativistic Heavy Ion Collider (RHIC) at Brookhaven National Laboratory and with nuclei at the CERN Large Hadron Collider. These experiments search for new states of very high energy density matter: Quark Gluon Plasma and perhaps the Color Glass Condensate and Glasma. These forms of matter are described elsewhere in this website. 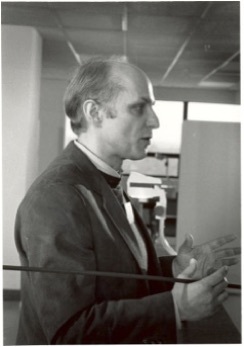 Helmut organized a very influential meeting in 1980 at the Center for Interdisciplinary Studies at the University of Bielefeld in Germany. This meeting had a dramatic impact on the direction of the careers of many us at the meeting. The first lattice gauge theory computations of finite temperature Quantum Chromodynamics (QCD) were presented, and they showed a phase transition to the Quark Gluon Plasma. Three major figures in theoretical physics, T. D. Lee, “Papa” Migdal, and Gordon Baym attended and shared their wisdom. I had prepared work on the space-time picture of ultra-relativistic nuclear collisions and the first realistic estimates of the energy densities which might be achieved. This paper was done specifically for this meeting, but there was so much interesting work being presented that there was no time to present it. It was the first time I had been in Europe. 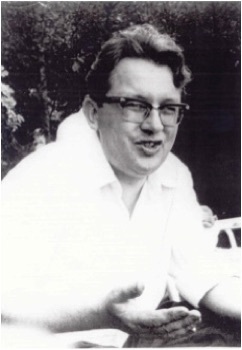 The biographical sketch was given on the occasion of the 70'th birthday of Helmut Satz. A more complete sketch of Helmuts family history and physics accomplishemnets as done for his 80'th birthday. I met Keijo Kajantie at that meeting organized by Helmut Satz in 1980; Keijo and I became lifetime friends as a consequence of the scientific discussion we had there. Keijo was described by his junior colleagues as very serious. We junior people would go out until the wee hours of the morning, particularly to the infamous “Ambassador’s Club”. One of my young Finnish colleagues who was rooming with Keijo made the mistake of waking him up early one morning after such an evening. With typical Finnish reserve, Keijo said nothing, just got up and went running. 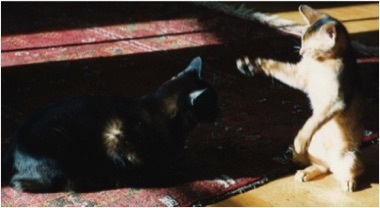 Keijo and I began to work together on the space-time description of ultra-relativistic nuclear collisions. I have spent much of my life thinking about this problem. My wife Alice and I visited Helsinki for three months in 1983. 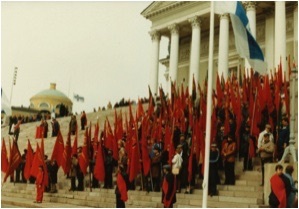 The picture on the left above shows the rally of the communists in front of the Lutheran cathedral near the city center of Helsinki. This is described in the paper I submitted for Keijo’s 60’th birthday, which is published in the proceedings of the Finnish Academy of Sciences. Above: Ulrich Heinz enjoying the June sunshine at Keijo’s summer place. Volodya Gribov’s reputation preceded him. I knew of him from work which he had done on the theory of high energy scattering. I visited Leningrad for the first time in 1984. Gribov was not present at the time but I met his son, Leonya. 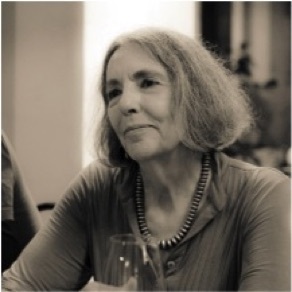 Leonya was a co-author with Misha Ryskin and Genya Levin of a Physics Report which laid the foundations for much of the work I have done in the last ten years. Leonya died not too long afterwards in a mountaineering accident. Gribov had the most forceful personality of any theoretical physicist I have known. This is not said lightly, since many theoretical physicists are not timid about expressing themselves. The manuscript here is for a memorial addition for Gribov. The photograph of Alice and Volodya was taken during a visit of Volodya to the University of Minnesota, where I was at that time on the faculty. He died relatively young, not too long afterwards, due to complications associated with emphysema. He was a very heavy smoker. I knew Bikash Sinha professionally through his work with Dinesh Srivastava on electromagnetic particle production in ultra-relativistic heavy ion collisions. This work is of high quality and has withstood the ravages of time. It is most remarkable because this was their first work in this area, it is seminal, and done with insight and care. Later, I helped Bikash get money from the Indian Rupee Foreign Currency fund to support a group of Americans going to a meeting in India, the first in the series International Conference on the Physics and Astrophysics of the Quark Gluon Plasma. There have now been about a half dozen such meetings in India, and recently, Bikash was the lead organizer of the Quark Matter Meeting in India. This is the largest and most prestigious meeting in the general area in which I do research. Bikash has done remarkable work in supporting this area of physics in India. He spearheaded the collaboration of Indian physicists at CERN-SPS, RHIC and the LHC. He has supported numerous schools and workshops for young people in India. He was also director of the Saha Insitute in Calcutta. The pdf version is the original version prior to submission for publication. or his 60’th birthday held in Calcutta. It is a roast. Walter Greiner is the most influential German theoretical nuclear physicist. He built and and supported a large group of theorists at the Institute for Theoretical Physics in Frankfurt. He is one of the founders of the Frankfurt Institute for Advanced Studies. He has done seminal and very important work on the existence and properties of superheavy nuclei, and on theories of particles in strong fields. 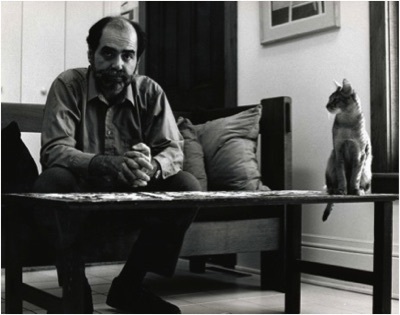 I have known of Walter’s work since I was a graduate student as my thesis was in an area which he did pioneering work. 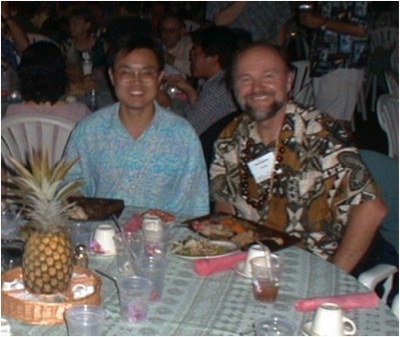 I met Walter years later due to our mutual interest in ultra-relativistic heavy ion collisions. Walter supported me for an Alexander von Humboldt prize at the University of Frankfurt, where I spent many happy months. I gave the roast at Walter’s 70’th birthday. The pdf file contains the content of the talk. It was done in the Frankfurt Ratskeller. I got to consummate one of my outstanding ambitions, which was to lead a group of Germans in song, swinging a beer back and forth in time to the music. It was great fun as you can see by the photo. Please note the poem in the text. This was composed by both Alice and myself. I had originally thought I could steal some text from a German romantic, such as Goethe, but nothing fit the accomplishments and personality of Walter. 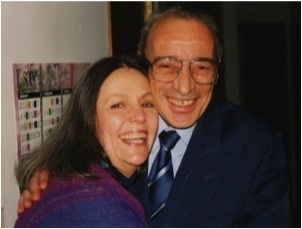 Walter died in 2016. I wrote a poem for his memorial meeting. It is largely about sicnetific discovery, but also about really getting lost in a kayak in the fog, and also about death. I met Vesa Ruuskanen through Keijo Kajantie on visits to Finland. I remember our first conversation was at a pool table in a hotel where there was a meeting of the Finnish physical society. Vesa and I would ski “together” on occasion. Vesa was a truly excellent cross country skier, and I am on the wrong side of mediocre. 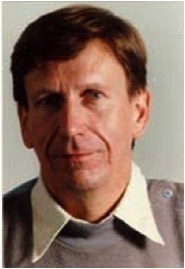 Vesa did much of the early work on the hydrodynamic study of ultra-relativistic nuclear collisions. His work was always well thought out, and always was done with care to detail. The presentation here is for Vesa’s retirement. When I first met him, he had developed an outstandingly clear understanding of the space-time dynamics particle production. I remember reading his papers over and over again. They were truly beautiful, and full of deep intuitive insight. 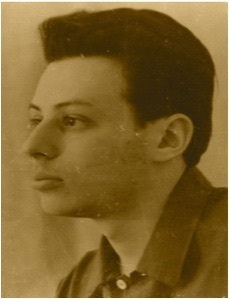 Evgenii Feinberg was a senior theoretical physicist from the Lebedev Institute. He was a genuinely nice man. I first met him at a meeting in Bad Honnef arranged by Richard Weiner. He came with Edward Shuryak, who I met there and who I am proud to count as a good friend. Evgenii suffered much under the Soviet system. In the prime of his research life, he was not allowed travel, as were most all of the good scientists. His wife grew up in the US, being the daughter of Armenian immigrants. They were leftists and during the time of Stalin, her family returned, taking her with them. Of course, all of her family disappeared. For some unexplainable reason, she was allowed to live. She became an expert in American jazz, although she was never allowed to visit the US. During the “economic reforms” of Gorbachev, Evgenii lost all the money he had saved up for the care of his daughter. His daughter had severe handicaps. The inflation rate and the poor pay of Russian scientists could not accommodate “modern times”. Evgenii always had a positive way of looking at any situation, and a good sense of humor. I miss him very much. The text is for a memorial edition. I respect TD Lee more than anyone I have ever met. His accomplishments are mind boggling. At the age of 31, he won the Nobel Prize for his work predicting the violation of parity. If parity were a symmetry of nature, then the laws of nature would look be invariant upon reflection in a mirror. The laws of nature are invariant under translation of coordinate and boosts to moving frames, so the violation of parity was totally unanticipated. TD was the first to seriously consider ultra-relativistic heavy ion collisions. He argued with Wick that such collisions might heat up the vacuum, and induce new states of matter. TD initiated a program so that Chinese graduate students could come to the US to study. This has been most important in rebuilding Chinese graduate education after the destruction of the cultural revolution. 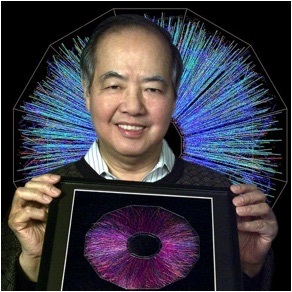 TD Lee holding up an artwork which represents the particles produced in nuclear collisions in the RHIC accelerator as seen by the detector STAR. When I came to Brookhaven in 1999, I was fortunate to work with TD and Nick Samios. 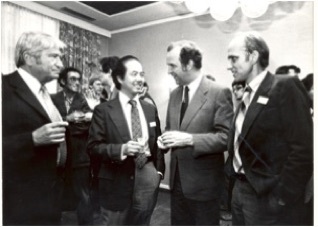 I was head of the Nuclear Theory Group, and TD was the Director of the Riken Brookhaven Center (RBRC). RBRC is a project funded by the Japanese to develop various aspects of the experimental and theoretical program at Brookhaven National Laboratory. One of its main thrusts is the training of young scientists. TD got me involved in the workings of RBRC. For several years, every Thursday afternoon, I would sit down and listen to TD and Nick strategize on various aspects of physics and physics politics. I think I learned more from these meetings than I learned in my entire time in graduate school. In November of 2006, there was an 80’th birthday celebration for TD at the Great Hall of the People in Beijing. Nick Samios and I were invited to the celebration, and asked to write a presentation on TD’s work in relationship to the physics of ultra-relativistic nuclear collisions, and RBRC. Nick gave the presntatio which is available as a pdf file. Alice and I wrote a poem for this occasion, which can be seen at the end of the file. It was impossible to find anything in the literature which fit our perception of TD, so we felt it was better to write something. The poem has reference to Khan Tengri, a 7000 meter mountain in the Tian Shan range. The name of the mountain means King of the Spirit. It is truly one of the worlds most beautiful mountains. An addition to my anecdotes is a pdf file of the after dinner talk I gave on the occasion of Edward Shuryak's 60’th birthday. Edward is a very good friend for a very long time. I knew him during his time in Novosibirsk, and when he began applying to emigrate from Russia, I helped him make contact with Gerry Brown in Stony Brook, who arranged a faculty job for him. Edward was one of the first people to think about quarks and gluons at finite temperature. He invented the words “Quark Gluon Plasma”. He is very creative, and with Edward you never have to explain anything twice. There is now a written version of the presentation. My thesis project at the University of Washington was on the same subject as was that of Miklos Gyulassy at University of California in Berkeley. I knew him as a student. 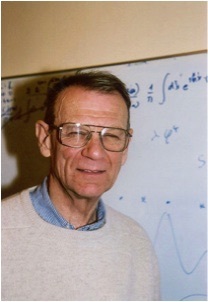 He later went off to work with Walter Greiner’s group in Frankfurt, and became one of the early seminal workers on the theory of ultra-relativistic heavy ion collisions. 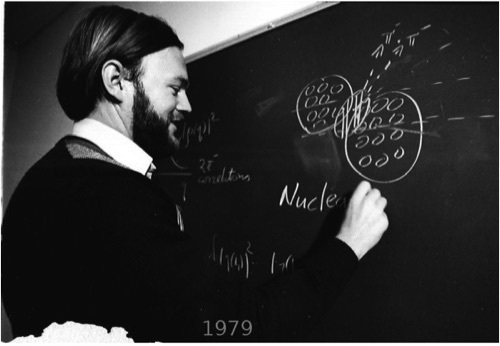 In 1979-1980 while I was at Stanford and Miklos had returned to Lawrence Berkeley Lab, I became interested in ultra-relativistic nuclear collisions, and I would drive up to LBL to ask Miklos questions and get an idea about what was known in the field. Miklos gently tutored me. 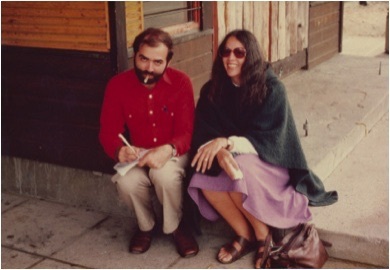 On the left is a picture of my friend Genya Levin lecturing. He is moving his hands very fast. This is what theoretical physicists do when they try to explain something they do not understand. It helps the audience think they understand what you are saying. Levin and Rushkin. Genya did pioneering and seminal work on the properties of gluonic matter at very high energy density. After the downfall of Communism in the Soviet Union, science and the arts were no longer strongly supported as they used to be. This led to a diaspora of Soviet scientists, mathematicians, artists, dancers, and writers around the world. Genya is Jewish, and he ended up with a faculty position at the University of Tel Aviv - one of the world’s premier universities. While there, he continued his work on the theory of high density gluonic matter. There was recently a scientific meeting to celebrate the accomplishments of Genya Levin on the occasion of his 70’th birthday, Levinfest. You can read about Genya in levinfest_talk, that has a few jokes, reminiscences and discussion of some of his scientific work. Genya is a real world traveller since his retirement in Tel Aviv spending part of the year in Santiago, Chile, and various institutions in the US and Tel Aviv. I met Dinesh Srivastava in the 1990’s. I invited him to visit me at the University of Minnesota where I was then on the faculty. Dinesh was trained in low energy nuclear physics and he is one of the few I knew who successfully made the transition from this discipline to high energy nuclear physics. 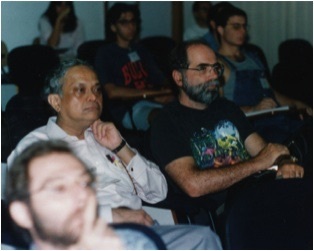 Together with Bikash Sinha, he made seminal and important contributions to the theory of electromagnetic radiation arising from a Quark Gluon Plasma as it might be produced in ultra-relativistic heavy ion collisions. Dinesh is gifted with a first rate mind, unending energy and drive, and a good sense of humor. I invited Dinesh to the University of Minnesota for a year’s sabbatical leave. He came with his entire family. He remembers well the very cold winter. In Minnesota on a very cold day on the TV news some reporter will take a pan of water, throw it up in the air, and as the water turns to ice, listen to it crackle as it hits the ground. Needless to say, this experiment is repeated in some variant or another by young men and boys with bad consequences for male health. The winter is indeed dangerously cold. 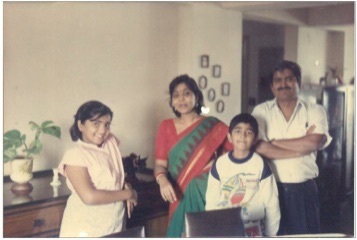 Dinesh and family during this visit are shown in the photo. 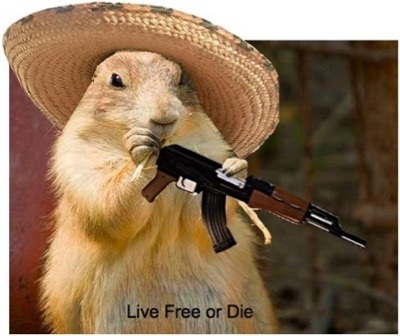 While in Minnesota, Dinesh and I would engage in tall tales about wild critters of the North Woods, some of which are described in the attached talk as a written version is dinesh_anecdote. This talk was given in a special session of the meeting QGPMeet, recently held in Calcutta, India. It brought together many of the young people in high energy nuclear physics within India. This is now a large community, and Dinesh is one of the central founders of this field in India. The talk was for a part of the meeting devoted to a celebration both of Dinesh becoming director of the Variable Energy Cyclotron Center, and of his 60th birthday. 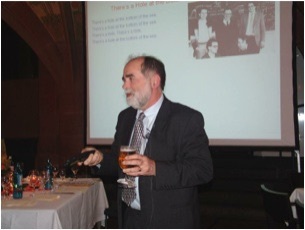 (In addition to this talk, I gave the opening scientific talk at the meeting.) Dinesh has set ambitious goals for the evolution of high energy nuclear physics in India. With his energy, vision and drive, and help of some of his friends such as Bikash Sinha and Rajiv Gavai, these goals are achievable. Takeshi Kodama is a much distringuished senior theoretical physicist from Brazil. We have been friends for many years. He has been one of the builders of a robust and growing theoretical physics community in Brazil, and is a strong contributor to the area of science in which I work. 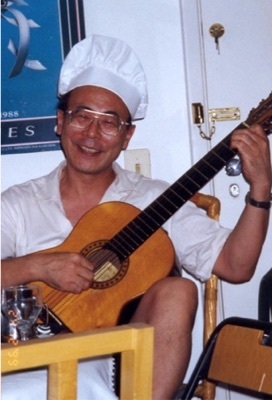 His 70'th brithday celebration was held in Rio, on one day of the meeting Relativistic Aspects of Nuclear Physics. Takeshi is one of the founders of this meeting. There were presentations by students, friends and his daughters. Together with Sandra Padula and Helio Takai, I put together this biographical sketch based on notes he sent to me. It is not simply a story of Takeshi's life, but also an allegory of what it is like to be a young person in a new culture where one does not quite understand the rules. It is also a story of a man who loves his family and his friends. Takeshi was one of the many Japanese who immigrated to Brazil from Japan before and after the second world war, and became a part of its truly multicultural society. My wife Alice recently celebrated her 80'th birthday. Her daugther Rachel and I set up the party, held in the faculty club at the University of California in Berkeley. Her daughter arranged an Alice in Wonderland theme brunch at her home. Family and friends were there from around the world. You can read about the celebration here. I put together a slide show and biographical sketch for her. I did not show the talk to Alice until the night before the birthday party and she pointed out a number of corrections,which we then worked into the wee hours to implement. Stephen, her son, put it into a final version. Alice's mother had kept scapbooks of photos and anecdotes about all of her children, and much of the material of the presentation comes from these old photos and stories. I hope the presentation catches some of the strength of Alice's character. This photo is based on an original from Waynespixels. 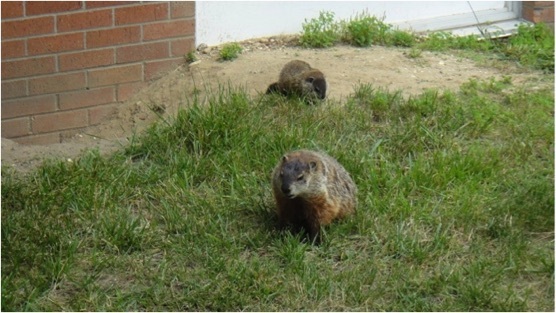 Wayne’s site contains many beautiful wildlife shots. I recently gave lectures at the Baikal School on Elementary Particle Physics and Astrophysics held in Bolshie Kotie. Bolshie Kotie is a small village on the shores of lake Baikal. This lake holds the most fresh water in the world, and has its own seal population, although it is about 1000 km from the nearest ocean. Like many Siberians, the story of how they got there is better not asked. 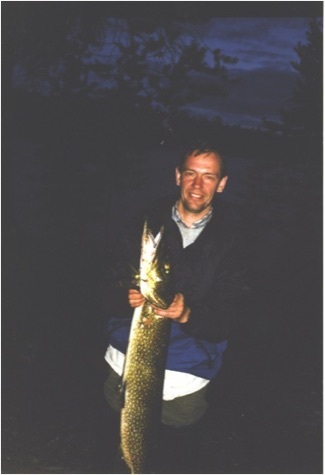 Peter Tinyakov sent me this picture of the huge pike (shuka in Russian) that he caught. I got the picture too late to include in the talk. Peter is one of my oldest friends with whom I spent many happy hours fishing in Aspen Colorado. At lake Baikal, I shared a cabin with Peter and his wife. 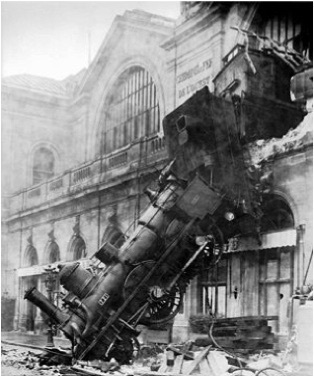 The problem with train service goes back a long way in Paris, for example, the photo on the left. On the left, you see us thinking about our next project together. ``Sometimes, to do something clever, you have to think’’, Shuwa always says. At one time, I tried to get a Visiting Scientist position for Shuwa at Brookhaven National Laboratory. You can read the memo I sent at shuwa.pdf. My good friend Jean Paul Blaizot from the Center for Atomic Energy in Paris has had a special relationship with Shuwa, and when he found out I was recommending Shuwa for this honor, wrote a very nice letter of recommendation shuwa_blaizot_1.pdf. The special circumstances that initiated this memo have been corrected. It is true that Shuwa has a refined taste in good wines, although in recent years he drinks less. 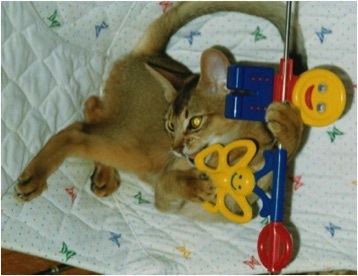 It is well known that cats have a much more refined sense of taste and smell than do humans. He still likes a good St. Emilion, suitably aired, and is now into Sicilian White Wine. He particularly likes Cusumano. He no longer drinks Grappa. He says it is bad for his liver. 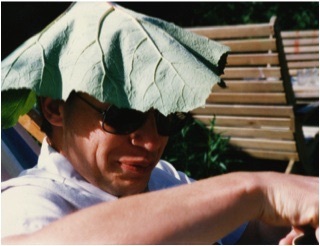 I first met Andrzej Bialas through Helmut Satz and meeting at Bielefled. 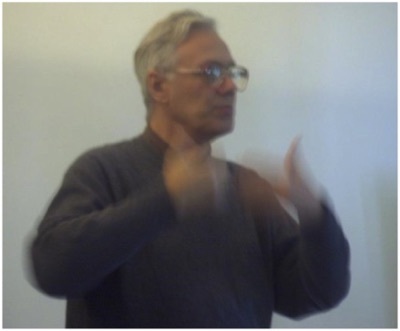 Andrzej built and supported the theoretical physics group at Krakow University. This was in the midst of the Cold War. Andrzej was the principal organizer of the Zakopane School of High Energy Physics which meets in the beautiful Tatra mountains. During the Cold War it was difficult to organize such meetings for many reasons. The young people who have come through his group are absolutely top rate theorists, largely due to Andrzej's stewardship. I have one talk given for Andrzej's 70'th brithday and a more serious one for his 80'th.